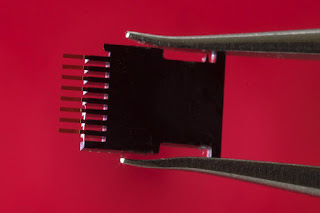 Researchers from the Spanish National Research Council (CSIC) have developed a biosensor that can detect type 1 HIV during the first week after infection. The experiments, performed on human serum, detect the p24 antigen, a protein present in the HIV-1 virus. This new technology detects the protein at concentrations 100,000 times lower than current techniques, and the total test time is 4 hours, 45 minutes, meaning clinical results could be obtained on the same day. The research is published in the journal PLOS ONE. The biosensor combines micromechanical silicon structures with gold nanoparticles, both functionalised with p24-specific antibodies. At the end of the immunoassay procedure, p24 is sandwiched between the gold nanoparticles and the micromechanical silicon structures. The gold nanoparticles have optical resonances known as plasmons. These are capable of scattering light very efficiently and have become one of the structures to attract most interest in the field of optics over the last decade. Micromechanical structures are excellent mechanical sensors capable of detecting interactions as small as intermolecular forces. The combination of these two structures produces both mechanical and optical signals which amplify one another, producing remarkable sensitivity, to detect the p24. The technology, which has been patented by CSIC, is also being applied in the early detection of certain types of cancer. 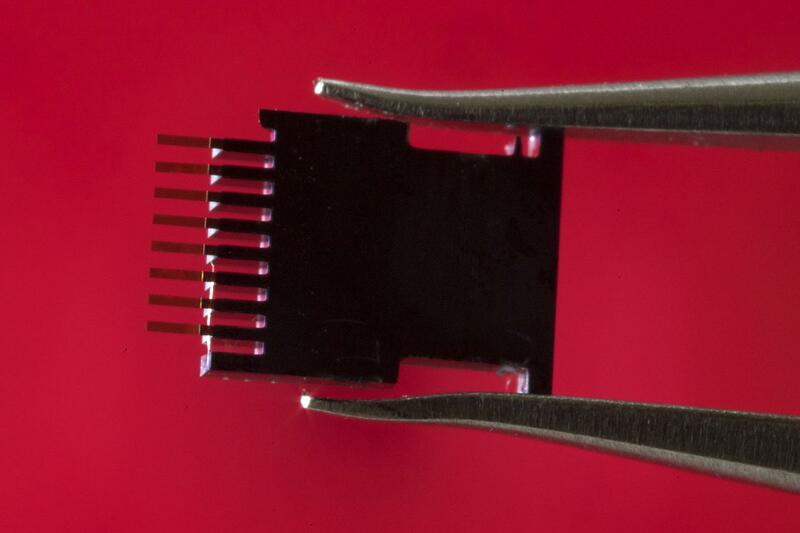 "The chip itself, the physical part, is identical for HIV tests and for cancer biomarker tests. What changes is the chemical part - the solution we apply - so that it reacts accordingly to what we are looking for. 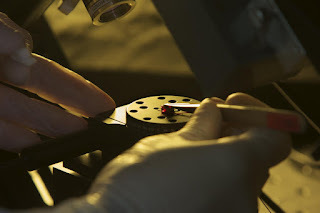 That's why our fundamental work is focused on developing applications for this new technology", CSIC researcher Javier Tamayo, who works at the Institute of Microelectronics in Madrid, points out. "The biosensor uses structures which are manufactured using well-established microelectronics technology, thus making large scale, low cost production possible. This, combined with its simplicity, could make it a great choice for use in developing countries", notes Tamayo. type 1 HIV during the first week after infection. The experiment begins by incubating one millilitre of human serum on the sensor for one hour at 37 °C to allow binding of any existing HIV-1 p24 antigens to the capture antibodies located on the sensor's surface. Next, it is re-incubated at 37 °C, though in this case with gold nanoparticles, for 15 minutes so the captured p24 proteins can be marked. Finally, the resulting material is rinsed to remove any unbound particles. "The test takes a total of 4 hours 45 minutes, which is really rapid. In fact, to confirm the diagnosis you could even repeat the test and the clinical results could be back on the same day as the medical examination. The results are statistically significant and could be adapted to medical requirements", explains the CSIC researcher. Acute human immunodeficiency virus infection is defined as the time from virus acquisition to seroconversion, i.e. the onset of detectable antibodies to HIV in the blood. Today there are two ways to detect HIV in the blood. Firstly, infection can be diagnosed by detecting viral RNA in the blood using nucleic acid amplification tests (NAAT), and secondly by detecting p24 protein with fourth generation immunoassays. The first method, based on detecting viral RNA in the blood, has a detection limit of 20 to 35 copies of RNA per millilitre, i.e. a concentration typically occurring two weeks after HIV acquisition. In the second method, during the fourth generation immunoassays, a detection threshold of p24 in 10 picograms per millilitre is reached. This occurs approximately three to four weeks after infection. "This new technology is capable of detecting p24 at concentrations up to 100,000 times lower than the previous generation of approved immunoassays methods and 100 times lower than methods for detecting viral RNA in blood. This reduces the undetectable phase after infection to just one week", says CSIC researcher Priscila Kosaka from Madrid's Institute of Microelectronics. The period between infection and seroconversion is approximately four weeks. The early detection of HIV is crucial to improving a person's health. Progressive changes occur after HIV acquisition, such as irreversible depletion of gut CD4 lymphocytes, replication in the central nervous system, and the establishment of latent HIV reservoirs. "The potential for HIV infectivity in the first stage of infection is much higher than in the later stages. Therefore, initiating antiretroviral therapy prior to seroconversion improves immune control and has been associated with benefits in CD4 cell count, a reduction in systemic inflammation, the preservation of cognitive function, and a reduction of the latent reservoir. Logically, its detection is critical to the prevention of HIV transmission", explains Kosaka. Patented by CSIC, this technology has been licensed to the Mecwins company (a CSIC spin-off) created in 2008 by Javier Tamayo and Montserrat Calleja, and current owner of three patents which represent the fruit of the CSIC researchers' labour. This recent research has received funding from the Spanish Cancer Association.